You Will Be Hosted By TV Personality Nicki Chapman! The Spanish Riding School of Vienna tickets are on sale now!! The world’s oldest and most famous equestrian academy celebrates its 450th anniversary this year. 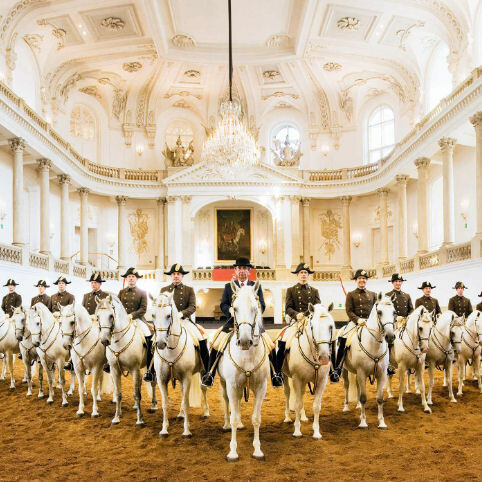 Considered Intangible Cultural Heritage by UNESCO since 2010, the Spanish Riding School in Vienna continues to delight both connoisseurs and newcomers to horsemanship almost half a millennium since its foundation in 1565. Synonymous with the Austrian capital, the Spanish Riding School in Vienna is the only institution worldwide where classical equitation in the Renaissance tradition of the haute école is still cultivated. The School is the only place in the world where these classical equestrian skills have been preserved and practiced in their original form. Many years of training fuse horse and rider into an inseparable unit. Audiences are treated to an unforgettable experience by the precision of movement of the Lipizzan horses in perfect harmony with the music. All of their famous in-hand work and movements above the ground will be performed including the Capriole, an upward leap made without going forward and with a backward kick of the hind legs at the height of the leap, the Levade in which the stallion puts its entire weight on its hind legs and raises its front legs no more than 45 degrees and Courbette where the horse raises its forehand off the ground, tucks up forelegs evenly, and then jumps forward in a series of “hops"..
Incredibly moving, highly sophisticated and full of Viennese glamour the tickets for the 250th anniversary Spanish Riding School Tour are on sale from Friday 9th September 2015.